However, logistics expenditure as a percentage of GDP declined by 3.4 percentage points to 14.6%, indicating improved efficiency. Despite the decline, storage expense as a percentage of total logistics expense remains high relative to more developed counterparts’, such as the USA’s and Japan’s. Therefore, reliance on smart technologies to reduce land acquisition and rental costs (by 70%, according to Huatai Securities) and labour costs (by 80%) has proved essential. Warehouse automation equipment, including automated storage and retrieval systems (ASRS), sorting equipment, and automated guided vehicles (AGV) have progressed the most. E-commerce giants Cainiao Logistics (Alibaba’s subsidiary) and JD Logistics (JD.com’s subsidiary) play an important role in smart logistics, as they conduct R&D to produce automation equipment and last-mile delivery vehicles. In addition, major local express delivery companies such as SF Express and ZTO Express went public in 2016 and raised funds to follow the smartisation trend. 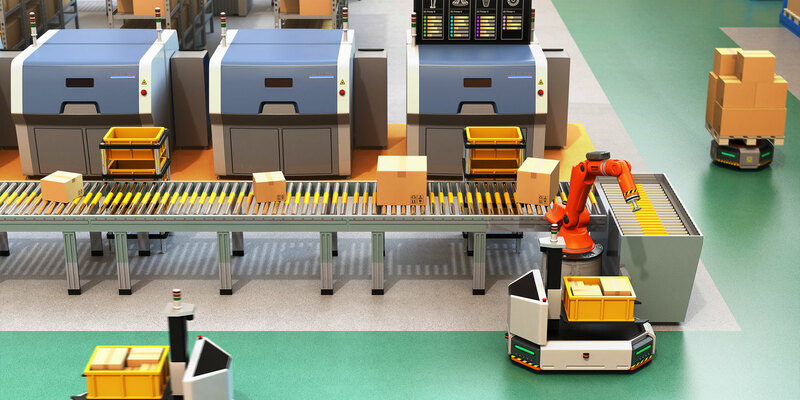 Independent warehouse automation manufacturers, as suppliers to the above two groups of companies, stand to benefit from the increasing application of automation equipment in the logistics field. The smart logistics market is also likely to maintain fast growth with sufficient capital and intensive R&D. China’s logistics sector has been on a strong growth trajectory during the past five years, driven by the country’s e-commerce boom that has been generating considerable demand for express delivery services. Total logistics value (i.e. the sum of cargo value) increased at a CAGR of 7.4% over 2012–17 to CNY 252.8 trillion (three times the country’s GDP). During the same period, the total number of express delivery packages increased at an impressive CAGR of 47.8% to 40.1 billion units (nearly half of the global express delivery packages in 2017). However, the country’s logistics sector is still not considered as efficient as its more advanced peers, despite improving logistics expenses. While China’s logistics expenditure increased at a CAGR of 5.2% to CNY 12.1 trillion as of 2017, as a percentage of GDP, it fell by 3.4 percentage points over 2012–17 to 14.6%, possibly indicating improved efficiency. However, the figure was almost twice that of USA’s (7.7% the same year) and Japan’s (9.0% in FY2015 ending March 2016). That said, during the same period, China’s logistics sector shifted to a more efficient structure: one with a smaller proportion of storage expenses (32.4% of the country’s total logistics costs, down 2.8 percentage points over 2012–17) and a larger proportion of transportation expenses (54.7%, up 2.2 percentage points). In comparison, the USA spent 28.6% on storage expenses and 64.6% on transportation expenses in 2017, while Japan spent 16.6% and 55.4% respectively in FY2016 (ending March 2017). Therefore, there remains considerable room for smart operations to enhance efficiency in the logistics sector in China. 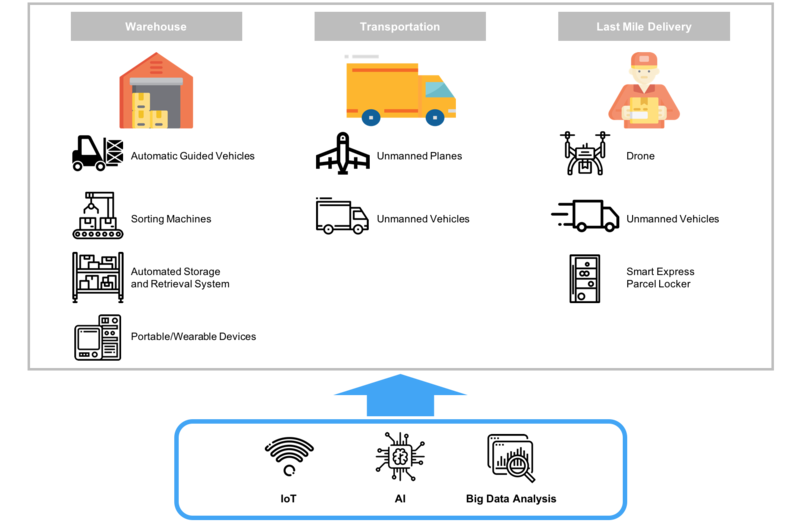 Smart logistics aims to optimise logistics decisions and automate execution processes by integrating advanced technologies such as the Internet of Things (IoT), artificial intelligence (AI), and big data analysis into three main sections, namely warehouse, transportation, and last mile delivery. According to Huatai Securities, the implementation of smart logistics in China is expected to reduce land acquisition and rental costs by 70% and labour costs by 80%. Hence, China is counting on smart logistics to further reduce expenses and improve logistics efficiency. The market size of China’s smart logistics sector, currently valued at CNY 338.0 billion, as per iiMedia Research, is forecast to rise at a CAGR of 20.3% over 2016–20E to CNY 585.0 billion in 2020E. Since 2016, the Chinese government has carried out multiple plans and policies for the development of the logistics sector, such as the Special Action Plan for the Cost Reduction and Efficiency Improvement in the Logistics Industry (2016–18) and the 13th Five-Year Plan for the Development of Trade Logistics. These policies emphasise the application of advanced technologies to achieve higher efficiency and provide guidance on the direction of development. In 2017, 132 equity investments worth CNY 20.4 billion were made in the logistics field, as per Zero2IPO Research. Based on CB Insights’ estimation, China accounted for 41.9% and 57.0% of global financing in supply chain and logistics in 2016 in terms of the case count and value respectively, signalling China’s globally leading position. Private equity (PE) investments dominated logistics investment value, with a share of 85.1% in 2017, followed by venture capital (VC) investments (13.9%), despite similar shares in terms of the number of investments. Over 2014–17, the value of PE investment rose steeply at a CAGR of 203.5%, supported by a more than sevenfold increase in 2016 (stimulated by newly promulgated policies), much faster than total PE investments in all other fields in China during the period. As such, the smart logistics market is well positioned to benefit from the rapidly growing investments for expansion. The warehouse industry segment has achieved substantial progress in smartisation, mainly on equipment and machinery automation, while unmanned transportation and delivery remain in the development and test stages. According to Qianzhan Industry Research Institute, the warehouse automation market is valued at CNY 75.8 billion as of 2016 (around 27% of the total smart logistics market) and is forecast to be worth CNY 262.0 billion in 2022E (CAGR of 23.9% over 2015-20E). By product, conveyor and automated storage and retrieval systems (ASRS) are the largest product types, with shares of 27.2% and 19.6% of the warehouse automation market respectively in 2016. Currently, the core products of smartisation development include ASRS, sorting equipment, and automated guided vehicles (AGV), which will be discussed below. With the integration of IoT and AI technology, such equipment will be able to read and process information as well as more efficiently plan and define the best routes and slots. ASRSs increase warehouse storage capacity by allowing the storing of items vertically in multi-story racks with the help of stackers and cranes. This computer-controlled system allows easy management of inbound and outbound of items. For example, for a warehouse with 11,000 pallets and monthly traffic of 10,000 pallets, ASRS provides 4–7 times the storage capacity that a traditional warehouse system provides, while incurring only 13% of the land costs of the latter, 21.9% of the labour costs, 33.7% of the handling expenses, and 63.3% of the investments. The market size of ASRS grew at a CAGR of 22.0% over 2012–16 to CNY 14.9 billion (5.3% of the size of the smart logistics market in 2016) and is expected to reach CNY 32.5 billion by 2020E (CAGR: 21.6% over 2016–20E; 5.6% of the size of the smart logistics market in 2020E). As of 2016, there were around 3,300 ASRSs in China, nearly triple the number in 2010, but this remains significantly lower than OECD countries’, for example Japan’s (around 38,000 units) and the USA’s (around 20,000 units). In light of the growing demand and increasingly higher land prices in China, the ASRS market presents high potential. In 2016, the tobacco, medicine, and retail sectors together accounted for around 39% of ASRS warehouses. Leading ASRS builders include Nanjing Inform Shelf (CHN, Inform) and Shanghai Jingxing Storage Equipment Engineering (CHN, unlisted), both of which started with shelf businesses. The former commenced R&D and manufacture of ASRS in 2008 and became a diversified warehouse automation equipment manufacturer in 2010. In FY2017, Nanjing Inform Shelf generated CNY 598.9 million in revenue, of which ASRS accounted for 35.2%. Shanghai Jingxing Storage Equipment Engineering is now specialised in the manufacture of ASRSs and warehouse shelves. Sorting equipment can be categorised into two main types: sorting conveyors and sorting arms. The application of smart sorting equipment can speed up sorting and enhance accuracy. According to Deloitte, the market size of China’s smart sorting equipment market is projected to reach CNY 30.5 billion in value in 2020E (5.2% of the smart logistics market), registering a CAGR of 43.6% over 2015E–20E. Within the smart sorting equipment market, express delivery-use sorting equipment is likely to surpass manufacturing-use sorting equipment to become the largest driver in 2020E, with its share more than doubling to 49.5% from 20.0% during the period. This should potentially be driven by rapid expansion in the express delivery sector during the period, supported by maturing online shopping behaviour among Chinese consumers. In 2016, Chinese company Zhejiang Libiao Robotics (Libiao) introduced the world’s first sorting robot, suited especially for express delivery parcels weighing less than 5 kilograms. Once a parcel is placed on the top flip board, these robots scan the QR code and read the information on the express waybill and self-route to the correct spot to begin the delivery process. For example, in a warehouse spanning 13,000 square metres and equipped with 350 Libiao robots, 18,000 parcels can be transported accurately (an error rate less than 0.01%) per hour to specified locations for subsequent processing. The use of the robot can thus save 70% of the human labour needed in traditional manual sorting (more than 300 people; an error rate of around 5%) for the same task. AGVs are used in warehouses for the automatic in-house transferring of items with the help of laser or electromagnetic sensors. China’s AGV market, although initiated in the 1960s, experienced extremely slow development for a long period. However, market growth has been accelerating recently, driven by state policies. In 2017, market size reached CNY 2.9 billion (about 0.9% of the smart logistics market), representing a CAGR of 68.1% over 2014–17 (CAGR over 2011–14: 44.2%). As of now, AGVs are used mostly in manufacturing industries. By segment, automobile and household appliances were the largest consumers in 2017, accounting for 23.8% and 12.2% of applications respectively. These manufacturing markets are likely to maintain a stable uptrend. Meanwhile, logistics-use AGVs are expected to gain a substantial increase in the near future, according to Gaogong Industry Research Institute (a local researcher in emerging strategic industries), alongside the expansion of the logistics sector, especially the trend of building automated warehouses. Logistics-use AGVs have efficient goods-to-person functionality, as they tend to be smaller in size and have greater mobility. China’s AGV market is dominated by local players due to their high cost performance, among other positives. Nevertheless, local manufacturers continue to rely on foreign brands for core parts such as driving controllers and laser navigation sensors, as few players are willing to conduct R&D. Moreover, domestically manufactured AGVs tend to be homogeneous in both software and hardware, leading to intensified price competition. 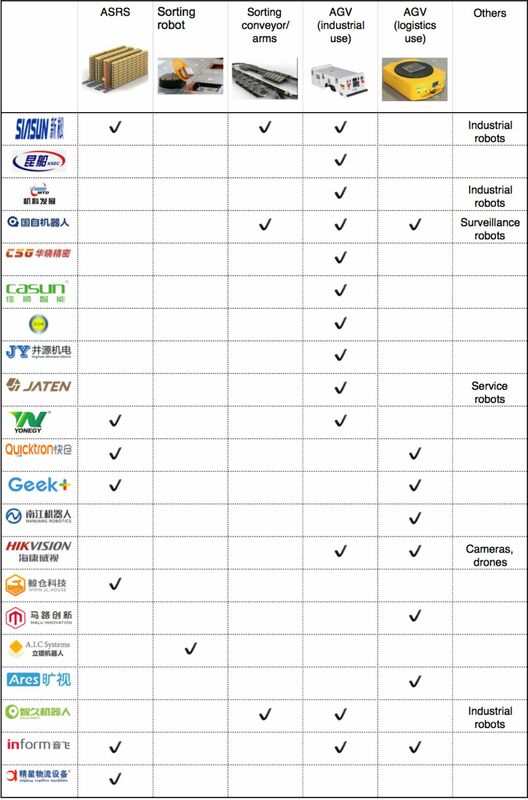 Middle- and high-end AGV (priced at CNY 200,000–500,000) producers are represented by Siasun Robot and Automation (CHN; market share: 13.2% in 2016), a professional manufacturer of industrial robots and system integration for various application fields. Its AGV products are applied mostly in automobile and electric power manufacturing and smart logistics. In FY2017, Siasun Robot and Automation generated CNY 2.5 billion in total revenue, of which industrial robots and warehouse automation sets accounted for 31.2% and 29.2% respectively. Guangzhou Yuanneng Logistics Automation Equipment Technology (CHN) is the largest lower-end producer (products priced at CNY 50,000–80,000), with a share of 10.6% of the AGV market in 2016. It focuses on AGV with different functions, including stacking, transporting, and vehicle parking. Benefitting from solid financial backing and a large customer base, e-commerce giants have become the drivers of the smart logistics field. Cainiao Smart Logistics Network (CHN; Cainiao), a subsidiary of Alibaba Group (CHN), is a one-stop logistics services and supply chain management solutions provider established in 2013. In the past few years, Cainiao has invested in various logistics companies such as express delivery companies and warehouse automation manufacturers. Despite being a platform and solution provider, Cainiao is also conducting R&D on unmanned vehicles (Cainiao Little G and Little G Plus) for last-mile delivery, which are still in the testing stage and are expected to be mass produced by end-2018. Currently, last-mile delivery accounts for over 30% of total delivery costs, as it requires deliverymen to drop packages door to door. With unmanned vehicles, this cost burden can be reduced significantly. In the automated warehouse sector, Cainiao developed an AGV named Cao Cao, and also relies on independent equipment manufacturers such as Quicktron, a local AGV manufacturer and Cainiao’s investee. Another Chinese e-commerce giant JD Logistics (CHN) — JD.com’s subsidiary — established a department in 2013 to build smart warehouse and logistics ecosystems, including to carry out R&D for intelligent automation equipment (e.g. AGVs, sorting machines, and stacker robots) and unmanned vehicles and drones for last-mile delivery. Drones cater mainly to rural areas where infrastructure is too poor to allow vehicle transportation to enhance delivery speed and reduce costs. Express delivery service providers are yet another group of market participants. 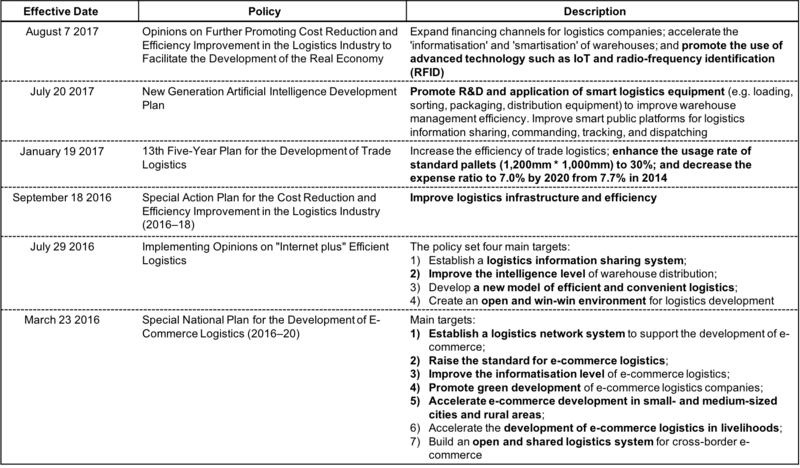 Since late 2015, major express delivery service providers including STO Express (CHN), SF Express (CHN), Yunda Holding (CHN), YTO Express (CHN), and ZTO Express (CHN) sought to go public either on local or foreign stock exchanges to raised funds. These funds are invested mostly in establishing or upgrading warehouse and transshipment centres, automation equipment, and information and logistics technology R&D. For example, STO Express plans to apply more sorting robots in more of its distribution centres in 2018, in the hope of reducing labour costs by 70%. SF Express’s completely automated sorting system that integrates an address identification algorithm and information distribution logics enables the transshipment centre to sort 150,000 packages per hour at a maximum; this helped the company’s operating margin edge up by the company’s operating margin edged up by 0.7 percentage points YoY to 7.5% in FY2017. ZTO Express also saw a 0.4 percentage point increase in its operating margin to 28.7% in the same year, after it installed more automation equipment in its transshipment hubs. These companies have followed the smartisation trend and applied smart sorting equipment to improve efficiency and cut costs in response to the swelling demand for express delivery. They continue to invest in smart logistics and to conduct R&D on it, while also using automation equipment supplied by independent manufacturers. Some independent manufacturers such as Siasun Robot and Automation and Hangzhou Hikvision Digital Technology (CHN) were not engaged in this industry, but have expanded their original business to take advantage of the rapid development and high potential demand. They usually have strong capital background and proficient R&D capabilities from past business operations to help them lead the market. Many technology start-ups, e.g. Malu Innovation (CHN) and Geek+ (CHN), have also been entering the field in recent years, especially in the logistics-use AGV market. These warehouse automation equipment manufacturers should benefit from the smartisation trend. Note: The companies are not listed in a particular order.